During the 1930’s two-thirds of the US would reach 100 degrees every summer. In recent years, that number has been closer to one third. The animation below shows how much more widespread hot weather used to be in the US. The EPA knows that the US used to be much hotter, but that doesn’t stop them from trying to implement their climate scam to wreck the US energy supply. As if you don’t already know, much of the US shows no global warming, in fact, it shows long term cooling. It even has a name, the “warming hole”. A search on Google scholar will show many papers. This is known by many researchers, with many theories why the US doesn’t match the global warming. Make of it what you will. 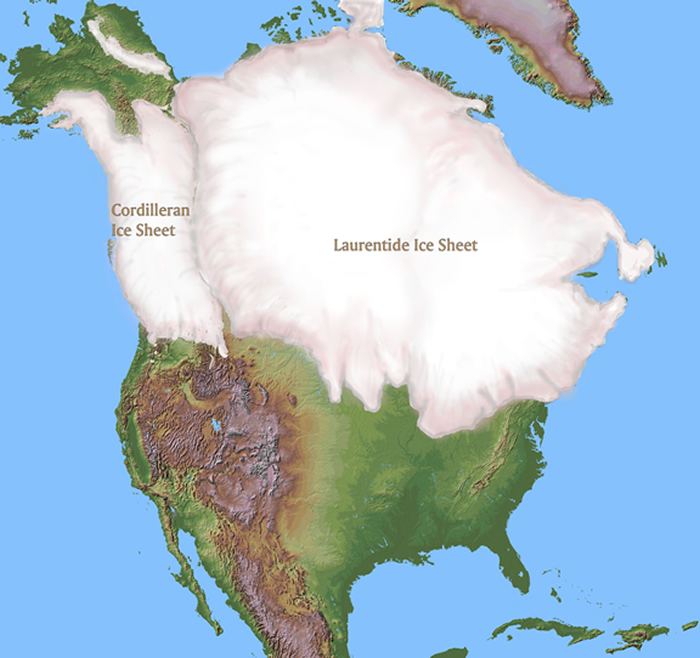 Is that approximately where the ice sheet forms when glaciation begins? Since you mention the wonderful events that brought us over 10,000 lakes in MN, and the several mile wide path carved out by the Great River Warren, where now the tiny stream called the Minnesota River now flows, I would like to mention four or more new papers that indicate a larger solar climatic response than the IPCC gives credit to. Ojala and Colleagues published a paper in the March 2015 issue of Quateruary Science Reviews that indicates evidence in Scandinavia of various cycles over a period of 10,000 years. The cycle of greatest magnitude is the 1,000 years solar eddy. It would seem the Roman warm period, and later the medieval warm period and the current warm period sandwiched about the little ice age is a ramification of that solar eddy. Also, there is more evidence that not only are there variations in total solar irradiance, but also variations within the spectrum..
No, those start up near the arctic, then move south. SG, how about a post with the heading..
And highlight the massive expansion of coal fired power stations planned around the world. The green group Kiko Network reports that Japan is going to construct 43 coal fired plants to replace nuclear power. error correction… missed end of paragraph somehow. China has built about 3 or 4 coal fired energy plants every month for the past 10 years and has separate plans to build 50 coal gasification plants estimated to produce 1.1 billion tons of carbon dioxide per year. There is no role for religious and political tyrants to play in the big scheme of things, except to be servants of the people to ensure they receive their God-given rights. That is why arrogant religious and political leaders paid greedy scientists to hide the truth from the public for the past 500 years, since Copernicus first reported in 1543 the SUN controls planet Earth. That is why arrogant religious leaders and political leaders paid greedy scientists to hide the truth from the public for the past 500 years, since Copernicus first reported in 1543 the SUN controls planet EARTH ! Thanks Tony! Have you tried this analysis with night-time lows? Does the list of stations that had night-time lows above say 80 look the similar for 2015 and 1936? Dr Evans, over at Jo Nova’s is putting up his revised solar notch-delay theory. That makes total sense. After a century of runaway hockey stick warming, we now have much … fewer … hot days then we had 80 years ago. It should be the opposite, and dramatically so. Global warming is baloney! The points made include that the proponents of the theory have been fanatically leftist and dishonest, have and continue to clearly manipulate evidence and data, have cried wolf over and over again in the past as their previous predictions of doom have NEVER come true, yet they continue their hysterical warnings of doom despite unbiased satellite data showing no warming for 19 years (there is NOT a problem), have embraced a strategy of smearing and ridiculing the distinguished opposition instead of debating them (because they will lose debates, and the ice polar ice sheets are growing NOT shrinking. I believe that most objective studies would show that our climate has improved with time. Of course, if you published that in a “peer reviewed” journal, your “peers” would try to prosecute you under RICO, for daring to show the real truth and even worse, threatening the flow of grant money. I doubt if Dinosaurs would agree. It is actually DARN COLD! It is only because of mankind’s ingenuity and adaptability that we have manage to make live reasonable outside the equatorial belt. Nice depiction comparing 1930s heat vs 2015.